Marco is one of the world’s leading designers and manufacturers of high quality, innovative hot water systems and brewers. Since their foundation over 20 years ago in Ireland, they have dedicated themselves to perfecting the art of beverage making by producing the finest equipment for brewing coffee and making tea. They are specialists in this niche market, understanding the physics, chemistry and art of brewing, enabling them to consistently design and build the best performing brewing equipment available. From workhorse boilers to precision hot water systems and batch brewers, we’re proud to be the Australian distributor for Marco’s wide range of equipment. A 2.2L manual fill batch brewer with heat retaining flasks. Utilising a flash brewing system to heat brew water before it is showered onto the coffee bed. The Bru works slightly differently to other flash boiler brewing systems as it introduces temperature stabilising technology at the end of a brew cycle to help curb temperature spikes that lead to batch brew over extraction. A smaller profile of the Bru unit, the F45M is a manual fill batch brewer able to prepare up to 1.8ltr of tasty filter coffee into a glass jug. Utilising Marco’s carefully designed flash boiler technology, you’ll get better temperature consistency that most traditional flash boilers at great bang for buck. The Jet6 is the mothership of Batch Brewing, with a maximum capacity of 6L of brewed coffee per batch. Brewing control is the major advantage of this fully plumbed brewing unit, with the ability to dial brew recipes for different batch sizes, including the ability to select a brew temperature to take advantage of the displacement boiler inside which has superior temperature stability over the smaller flash brew systems. Not technically a brewer itself, the SP9 bridges the age old debate between manual vs mechanical brewing. 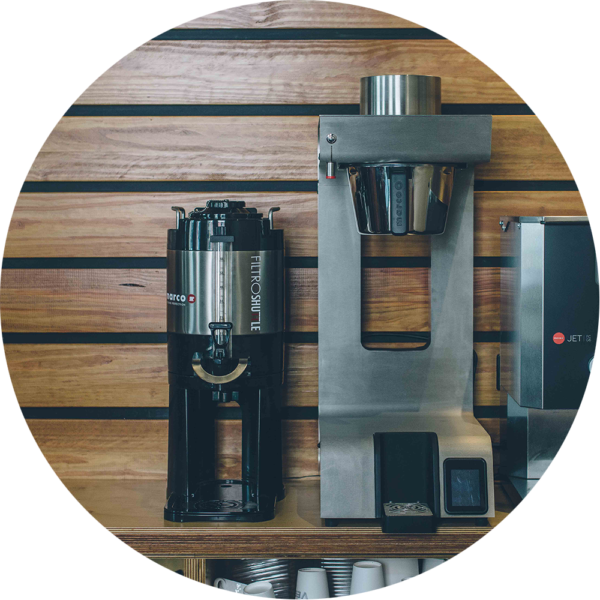 Using an undercounter recirculating boiler, this system offers controlled volume and dispense of consistent brew temps for your favourite manual brewing apparatus. 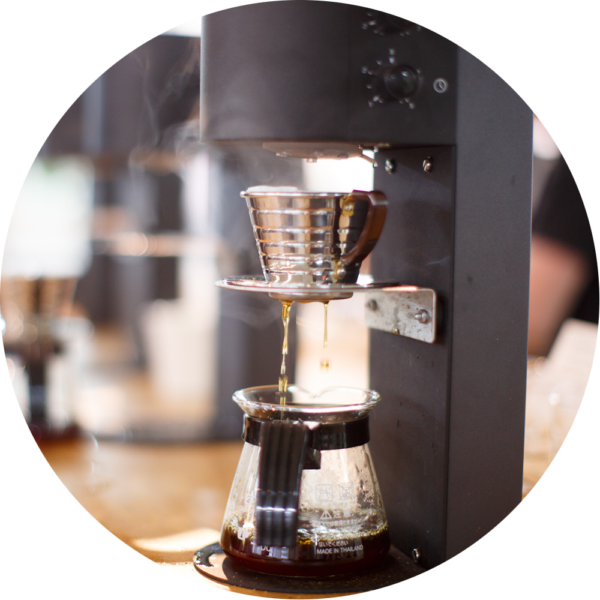 The barista is able to dial in their brew ratio, hit go and get onto other jobs while the equipment handles the rest of your brewing. 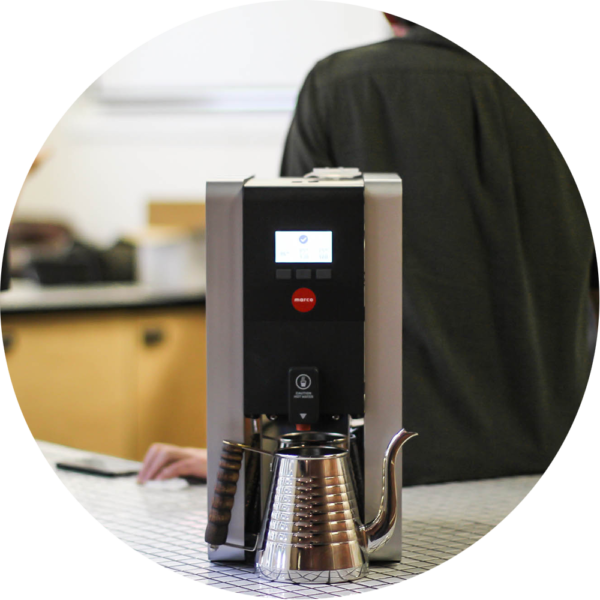 With either single or double on bench dispense heads from the single boiler, the SP9 offers the sweet spot of hands-free, consistent brewing in small sizes with a design that’s a clear talking point. We have two thermally insulated options to hold your delicious brewed coffee. For the Bru F60M we have a 2.2ltr Airpot with a simple press pump on the top for dispense. For the Jet 6, we have a neatly designed 6ltr flask – with a modern design, elevated base and tap dispense, it’s got the goods to stand proud on your bar. We all know that bench space is limited and great customer interaction invaluable: Marco’s under counter systems are designed with these realities in mind. Led by the new SP9 system (perfect for an Australian filter program! ), the options range from the super precise, lab-like Uber Boiler to efficient, bulk volumes of hot H20 with the Uber Font/Ecosmart combo. Not really just a hot water dispenser and not technically a brewer itself, the SP9 bridges the age old debate between manual vs mechanical brewing. Using an undercounter recirculating boiler, this system offers controlled volume and dispense of consistent water temps for your favourite manual brewing apparatus. The barista is able to dial in their brew ratio, hit go and get onto other jobs while the equipment handles the rest of your brewing. With either single or double on bench dispense heads from the single boiler, the SP9 offers the sweet spot of hands-free, consistent brewing in small sizes with a design that’s a clear talking point. The Mix is the next generation of water dispensing systems that connects to a 3 litre under counter boiler (UC3). The Mix boasts ultimate temperature adjustability, accurate programmable portion dispense all with a sleek and minimal above counter font. The Mix under counter boiler has ultimate versatility and can be connected to the Mix font, or as a multi-function system: SP9 Head and Mix Font. The Über boiler was developed as a response to the growing need for a precise water delivery system for cup to cup coffee brewing and tea infusion. With years of expertise in high quality coffee equipment, Marco consulted with leading industry figures to ensure that the Über delivers from a technical viewpoint and comes with a Barista friendly interface. Achieving an incredible 0.1C water temp stability, the Über Boiler is beautifully finished and designed, ready to take your café to the next level. Taking the refined aesthetic of the Uber Font and pairing it with the efficient, reliable engine of the Ecosmart boiler range, this setup is a great meeting point of form and function. Two under counter boilers – either 4ltr or 10ltr – feeding into the curved stainless steel of the on-bench dispense font, baristas are able to set two separate boiler temperature in 0.5C increments along with dispense times. A great option for bulk hot water supply in an appealing, bench space saving setup. Need hot water for tea, filter coffee or long blacks and don’t want to tap into the espresso machine or a kettle? Check out Marco’s range of on bench options from traditional manual fill urns to plumbed in to temperature controllable Ecosmart boilers. The Ecosmart range of boilers from Marco is the tried and true tech used by specialty cafes around the world. Plumbed in, the 10ltr capacity boiler is able to be adjusted in 0.5C increments, dispensed at the push of a button. The intelligent software manages fill with a priority on temperature stability. Dispense times can be set for common volumes and the understated design will fit neatly onto any back bar. The Ecoboiler range offers a great, plumbed in, hot water solution. With a 5ltr capacity and some solid temp stability, the T5 foregoes some more advanced controls to offer up a great value boiler system for the cafe or office. Old faithful – prior to the advent of more refined technologies, the manual fill urn was the go to in cafes, offices and many a roastery for bulk hot water supply. They’re still a great option if you’re after a lots of hot water with zero setup and minimal spend.